Be the first to share your favorite memory, photo or story of Mrs. Jo Allan . This memorial page is dedicated for family, friends and future generations to celebrate the life of their loved one. 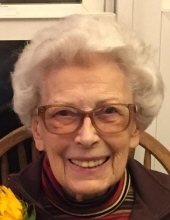 Jo Allan Caplinger Napier, 92, of Aiken, SC passed away on Saturday, February 2, 2019 at the Aiken Regional Medical Centers. The daughter of Owen and Josephine Berkhart Caplinger, Jo was born November 5, 1926 in Frankfort, KY. After a brief career as a petroleum geologist she married A J “Jake” Napier (deceased) and became a homemaker. After living in Louisiana for over 20 years, she and her family returned Frankfort for 40 years. In 2006 she moved to Aiken to be near her daughter. Surviving Jo are children Richard Napier, husband of Maria Palazzo Napier of Naples, FL and Mary Lloyd Napier Littrell, wife of William Littrell of Aiken, SC. Jo has three grandchildren Lindsay Napier Gibson, wife of Edward Gibson of Wellesley, MA, Bradley Napier of Philadelphia, PA and Emily Littrell Jackson, wife of Matthew Jackson of Chattanooga, TN. In addition, she has two great grandchildren Owen and Henry Gibson. Jo was a loving mother, grandmother and great grandmother who took great joy from her family. She was so proud of them all and happily shared in their successes. She was always genuinely interested in the activities of her extended family. She had a keen mind and considerable curiosity. Most importantly, she will be remembered as a sweet, kind and generous person. Memorial arrangements will be announced at a later date. In lieu of flowers the family suggests contributions to the Franklin County Council on Aging-Capital Activity Center, 202 Medical Heights Dr, Frankfort, KY 40601. To send flowers or a remembrance gift to the family of Mrs. Jo Allan Caplinger Napier, please visit our Tribute Store. "Email Address" would like to share the life celebration of Mrs. Jo Allan Caplinger Napier. Click on the "link" to go to share a favorite memory or leave a condolence message for the family.